We visited Puerto Rico last March at the end of a long vacation in the Florida Keys. Moving here was something we were open to at the time, though not really seriously considering. We kept it light and casually said things like, “hey, wouldn’t it be fun to live here? We could go to the beach on the weekends!” During that trip we visited the Montessori school where my son will soon be attending. He seemed to really like the environment during our after hours tour, so his comfort and excitement about that really sealed the deal about which town to move to if we did indeed end up moving. We didn’t announce to the kiddos that we were moving until Trevor and I were absolutely certain. Trevor flew back to Mayaguez with my Dad to look for houses last June. Even then it was just, “Dada’s going to Puerto Rico with Abuelo!” D said, “Next time, I want to go too.” And I could honestly say, “ok”. 1) some just “disappeared”. Bad mama! Bad! In know. But honestly, they didn’t notice any but one was gone. 2) We discussed others that would not make the move but I promised I would buy/make another in our new home. 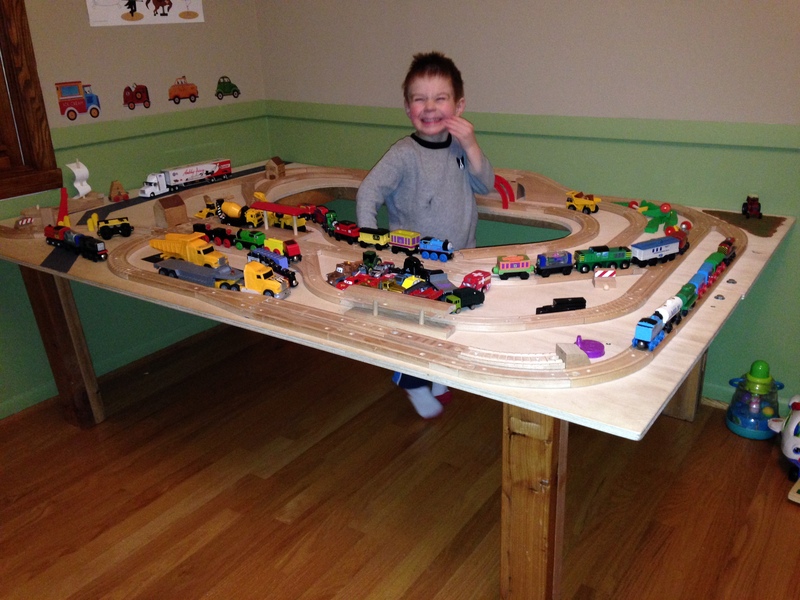 The biggie: his train table. Abuelo’s going to store this one at his house and make you a NEW one in PR! ooo….you’ll have TWO! 3) we gave some away to friends. Proud Mama because D was willing and ok with it. Maybe ’cause there might be the possibility of seeing it again when we visit. Things got rough as moving day neared. The babysitter was at the house full time. D wet his pants so much more often than he used to. P became clingier. They were troupers. I probably could’ve had more patience, but did my best. We just wanted the move to arrive. Thankfully, at no time did they mention not wanting to move. It has been 8 days since arriving in Puerto Rico. How are D and P adjusting so far? Pretty well. Good moments and bad. D still wets his pants and we had to go back to setting the timer every 50 min to make him go, like we did when he was first trained. It’s tough because we’re still waiting for 48 boxes to arrive, so things like his booster seat are still absent. So meals are a little struggle getting him to sit still. The second day here poor guy threw up a whole bunch. I don’t think it was an illness, just his body adjusting to the heat or something. Dunno. We held him tight. P still wants hugs and being carried around, which does get tiring but I know she needs it so I do it as much as I can. She needs to be rocked/cuddled/co-slept to sleep more than ever. Part of me wants to sleep-train her, but actually, it’s not that bad. She needs to know we’re near. Since my Dad and step-mom were here the first week, the kids started to call our new house “Abuelo’s house.” No kiddos, it’s ours. All ours. I think we’ll be just fine. 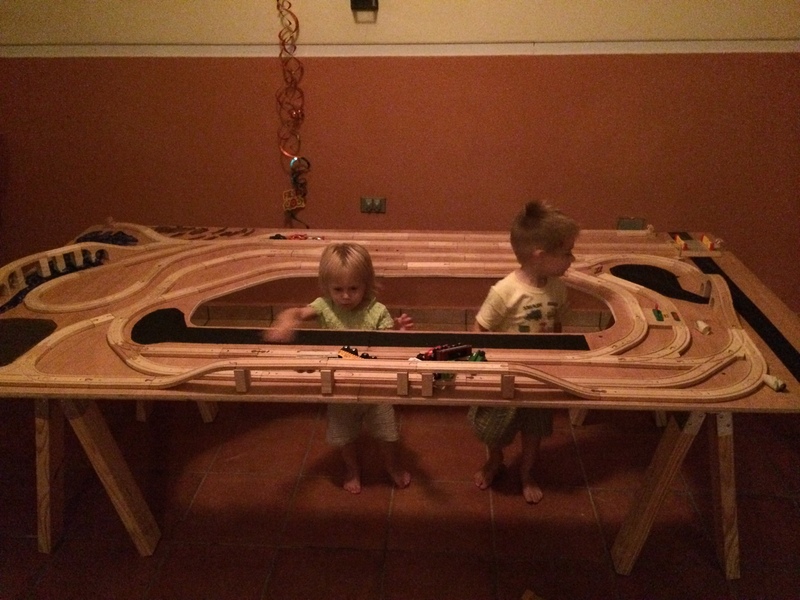 new train table in the works. Outside on the patio! I prepared Farrah Star for our move from Madison, Wisconsin to Montreal by doing nothing. As an attached baby all she needs is me and I too moved to Montreal. We sold *sob* her crib *sob* but she was already sleeping in a bed when we travelled so I figured that transition would be smooth. Luckily Arlo had a classmate who had just moved so the concept was fresh in his mind. I didn’t over-sell or over-promise and I only brought it up when an opportunity presented itself. For example, maple syrup on his waffle -> Canada -> Montreal -> Hey! We’re going to live where maple syrup comes from! Since we had playroom space in the new apartment I didn’t have to shed much of his possessions but what was donated we did together. And yes, we did buy him a housewarming present and have no qualms about it. The most important thing I did (and have done) is match his emotions – the best coping tactic I ever learned from my Doula training. If he was high on the idea, I became excited. If he acted indifferent on the topic, I kept things matter-of-fact or even dropped it. Very early on Arlo could verbalize that we were moving but I was never sure if he truly understood the gravity of such a change. How could he? To spell it out – “you may never see your friends again” – would be cruel. Not everything had to be made crystal clear. That said, I was constantly waiting for the shoe to drop in an ocean of tears. It never happened. In order to maintain his routine we enrolled him in school immediately. That’s what he does. That’s what he loves. Still, I pay very close attention to his feelings and comfort towards that new environment and check in with his teachers. I’m happy to report all is well. It’s been two weeks since arriving in Canada. How are Arlo and Farrah Star adjusting so far? School is the only place where all is well. Arlo is struggling with heightened reactions to the most minor of perceived or real transgressions. He also developed a strong attachment to his possessions (even a snack) which was never the case prior to moving. Our days are filled with the “classic” behavior that comes in response to a major life change. 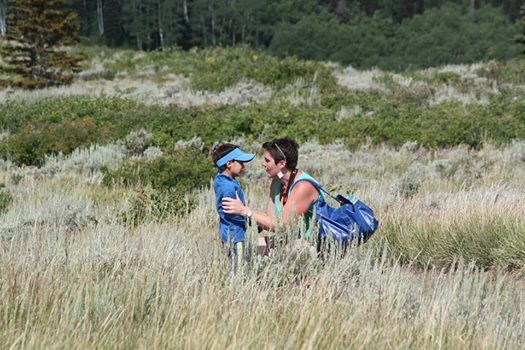 My friend Pearl captured this moment when we were in Utah (a vacation between the move) and it depicts my and Arlo’s current relationship perfectly. He is sad, he is hurt and he is acting out and I am responding as best I can by meeting his eyes while firmly holding his body and just listening. I often don’t know how to reach past this pain or behavior and it is both heartbreaking and exhausting. Usually this picture would include Farrah attached to my body which, to be honest, is challenging when my son needs all of me. We are only two weeks in Montreal I remind myself. We have each other and that isn’t going anywhere I remind him. I am his constant. 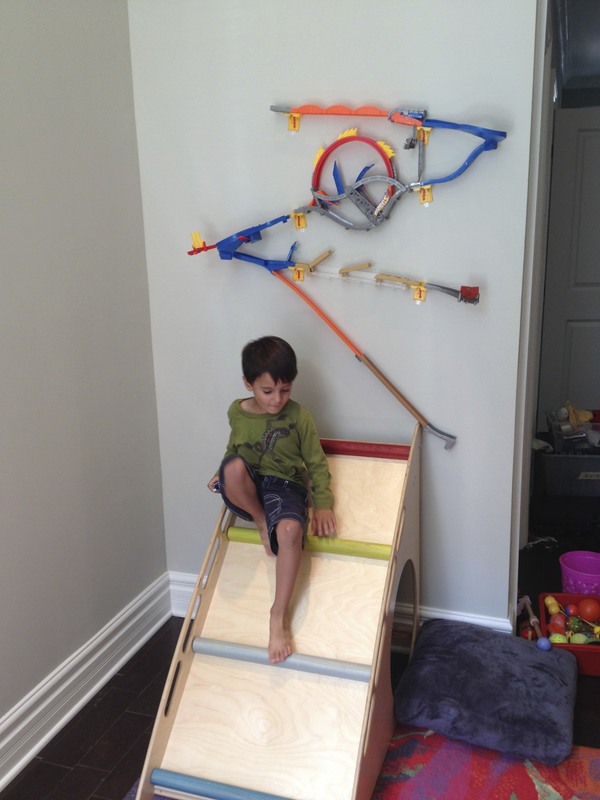 This entry was posted in Uncategorized and tagged attachment parenting, Canada, ex-pat, Mayaguez, Montreal, motherhood, moving, parenthood, Puerto Rico, relocation, toys. Bookmark the permalink.